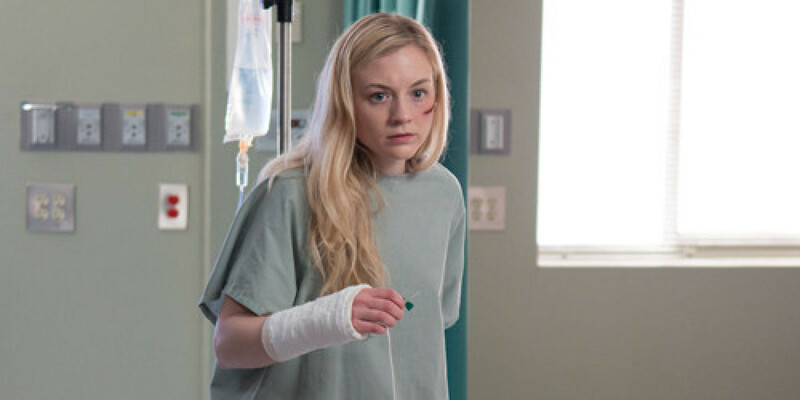 So, we finally know where Beth is and we have also seen the darker side of those who hold her. As always in the zombie apocalypse, they start off seeming benign, only to then turn out to have a not so pleasant side to them. Not that I have a problem with that necessarily as it only makes sense in the world in which they live, but the show has to be careful not to retread old ground. This group’s reveal is by no means as shocking as Terminus’ cravings for human flesh, but the concept of keeping you alive only if your useful is pretty disturbing too. Even the Governor didn’t do that. Talking of the Governor, there are parallels to be drawn between the hospital and his old society. They both appear to be ‘civilised’ with their attempts at reconstructing the order of the old world, whilst using power to ensure their own safety. The police and hospital uniforms that this new lot wear are interesting to see on the show after its having been so long since Rick retired his Sheriff badge. There is the potential in future episodes to really draw a comparison between the path Rick chose where he embraced the new world, and the one he could have chosen where he clung to the old social constructs. We are not there yet as the characters in this recent episode feel too thinly drawn, but it’s possible further down the line I think. Talking about the thinly drawn characters, this aspect did have an upside. As we didn’t know anyone but Beth there was a real sense that anyone could become zombie food, and pretty much anything could happen. This allowed for some excellent tense scenes which worked in a different way to normal on the show, as the focus was not on the threat of walkers, but on the fear of being discovered. We almost had a spy thriller on our hands in some moments, and I have to commend the show for mixing things up like that. As to which new characters have my interest currently, I’m mostly interested in Noah. I pick him out for three reasons; the first being that he has an unusually patient nature on the show, and his imprisonment could have given him an interesting take on the world. The second reason is because I think he is who Daryl is hiding in the woods. And thirdly because he is yet another Biblical name to be introduced after we have already seen Abraham and Gabriel on the show. They all seem, to some degree, to be playing against what their Biblical counterparts are known for; Abraham refusing to make sacrifices, Gabriel being unable to impart guidance and now Noah saving his own skin. Perhaps this is just coincidence but I’m interested to see how these characters develop. Bringing this back to the episode itself I have to note that I thought Emily Kinney did a great job of leading an episode when she (if we are honest) doesn’t exactly have the greatest fan support. I actually quite like Beth, although I acknowledge that she hasn’t hadtoo much in the way of development. Still, Carol was a late bloomer and I see no reason as to why the same cannot happen to Beth. The episode may have been the weakest so far, but that wasn’t due to Kinney. Instead I think it was down to the episodes somewhat fluffier approach to storytelling. The last few episodes have been really tightly scripted and they moved along quickly, consequently leaving behind any story ideas which dragged down the pace. I’m all for this episode choosing to slow things down a little, but unfortunately that approach produced a somewhat padded out episode. Regardless of the episode lacking a little of the season’s commendable economic storytelling, it was still an interesting one in my eyes, and made for a refreshing change to the normal world of The Walking Dead. That is however as long as we don’t have a similar one next week. The show needs to return to something of its usual self, and with Carol’s introduction at the end of the episode there, I feel fairly confident that it is going to do just that. With the show’s continued exploration of how everything has a price I’m expecting either Beth or Carol to not make it out of this hospital in one piece. I personally think that a sacrifice from one is coming in order to save the other one, but I would be interested in what you guys think about that. So please do let me know in the comment section below. For now though I’ll leave you. As always thanks for reading. There is no ‘Zombie Kill of the Week’ this week as frankly there wasn’t much in the way of notable zombie deaths, but I’m sure it will return in full bloody glory next week! Until then be sure to let me know your thoughts in the box below, I want to hear from you! Kinney’s not a very good actress and I found myself not always believing in her character, or the decisions she made. That said, the episode was still interesting, in that we got to see a different part of this world and how it might potentially crash into the one we already know. Good review Rumsey. Hmm it seems that not many people liked her, but I’ll stick with my guns and say that I thought she did a good job here! I hope they do collide, and in a way which is slightly less explosive than the Terminus one. I actually did not think Kinney did a very good job here. Not bad, just very middle of the road. The idea of this hospital is quite interesting, but the leadership arrangement seems very peculiar to me. I pointed out a number of inconsistencies in the episode overall in my review. One being that I don’t know why anyone follows Dawn in the first place. I like your thought of either Carol or Beth dying for the other while one escapes. 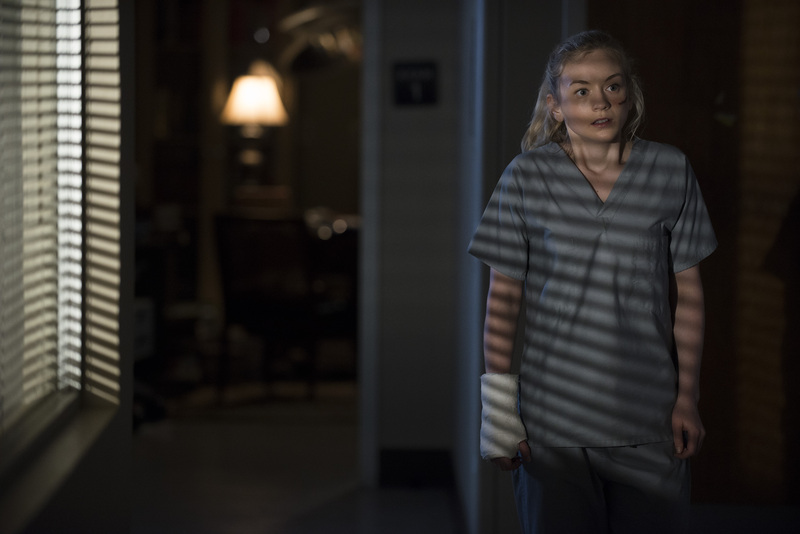 I think Carol already has some injuries that will cause her death, but she will determine how she dies in that she will protect Beth and see that she is free. Well fair enough, I thought that if the episode had been tighter then she would have come across better. Oh I don’t want her to go but I have a feeling she will, and your way makes sense. It’s the weakest one so far for sure, but that’s to be expected after how packed the last few have been. Well there was something for you to enjoy at least then! That scene with the woman who’d been bitten on the arm was brutal. I didn’t think it was that bad, I just hope the group splitting doesn’t slow everything down again. Was she the one in the office? I don’t remember! Sorry for the late response by the way, your comment got caught up in the spam filter for some reason.